This past April, the Johns Hopkins Graduate Consulting Club (JHGCC) held its annual Biotech and Healthcare Case Competition. For the past five years, this event has served as a hands-on experience for students who are interested in pursuing careers outside academic research, including careers in both biotechnology and consulting. This year, 50 teams participated, representing schools from all over the nation. Teams were tasked with developing an international expansion strategy and were called upon to present this plan during the first round. From there, five teams were selected to enter the final round, in which they pitched their strategy to external management consultants. In the end, it was one of the Johns Hopkins teams that came out on top. 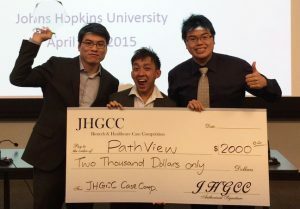 The team – called PathView – was made up of three Ph.D. graduate students from the Pathobiology program at the Johns Hopkins School of Medicine. Byung-Hak Kang served as the team captain while his teammates included Weijie Poh and Joshua Wang. All three team members are also Margaret Lee fellows. For winning the competition, the three took home the $2,000 first prize, and each team member received a membership to PrepLounge, an online service for preparing for consulting interviews. Poh and Wang also recently won another prominent business competition at the 16th annual Johns Hopkins University Business Plan Competition. Their team – this time under the name PathoVax – consisted of the two Pathobiology students along with Jessica Jeang and Nicholas Calcaterra. When the results were announced, they won the grand prize of $10,000 in the Medical Technology (Graduate Track) category for their plan focusing on a new broad-spectrum HPV vaccine: RG-1 VLP. This vaccine is a second-generation highly broad-spectrum HPV vaccine co-developed by Dr. Richard Roden, a professor of pathology at Johns Hopkins, and Dr. Reinhard Kirnbauer from the Medical University of Vienna. But the team isn’t stopping there. Using these same principles, Poh, Wang and Calcaterra have formed a biotech startup under the PathoVax name to license this technology from Johns Hopkins. They have also applied for a Maryland Innovation Initiative (MII) grant, worth up to $100,000, to finalize translational studies on this broad-spectrum vaccine and foster its journey from bench to bedside. A decision is expected in late June. For more information on the company and its goals, contact Weijie Poh at weijie@pathovax.com or visit their Facebook or LinkedIn page.